Greg, a reclusive overnight traffic reporter in Washington, DC, has spent his life in fear, avoiding anything that might shatter his tenuous grasp on normal. It turns out Greg has no idea what it really means to be afraid. After witnessing a horrifying fatal crash, a crash Greg believes he had a hand in causing, he begins to see the ghost of the dead driver. The strain becomes unbearable as Greg attempts to determine why the ghost has sought him out, what it wants from him, and whether any of what is happening is even real. 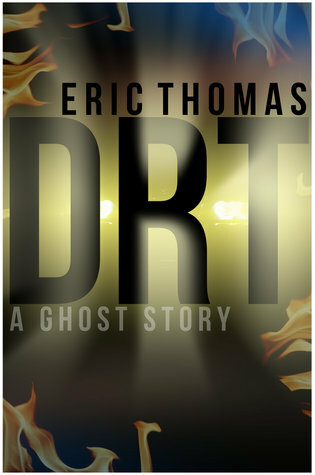 DRT is the second novel from author Eric Thomas. It's an alternating look at the absurd and the shocking as he tells the story of one man's struggle to maintain his sanity. My emotions concerning this book are all over the board. There were times it read like a 5 star book that you just can't put down while other parts didn't hold my attention as well, sort of like a 3 star book would do. Overall, I enjoyed it, so the 4 star rating seems appropriate. Some parts of the book could have used a little more polish, while other parts were pure awesomeness. There would be a scene that captured my imagination, the details vivid, but followed by a page or two of conversation or internal monologue that just didn't do it for me. However, to the author's credit, he always brought me back, each chapter (just about) ending on a cliffhanger and usually a good one that made me say "oh wow" out loud. In addition to some of the conversations not capturing my attention, I didn't particularly like the format used. There would be an entire page of dialog with no other descriptions, of either the dialog or anything else. The technique is used for rapid conversation, but I personally find it slightly annoying. Half way through I'd lose track of who was talking, having to go back and retrace the conversation. Occasionally identifying the speaker would have helped, not to mention streamlining some of the banter. One thing I think the author did extremely well was simile and metaphor, particularly simile. As mentioned already, not only would there be a scene that captured my attention, the details would be assisted by a well placed simile. For example, take the following quote. ...her gaze drifted up to the ceiling as if there was weight attached to the back of her head. Those and many more like them made the story fun to read, because not only was the plot interesting, these additions made it come alive. Review Disclaimer: I picked up the book for free on Amazon. The author did not request a review.